Middle Eastern producers have started to reveal their new May prices to Egypt with decreases in line with market expectations as per the pricing service of ChemOrbis. 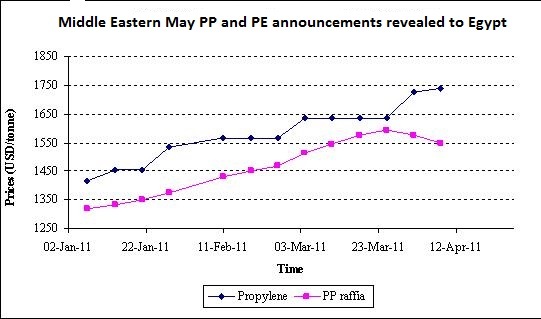 However, despite the decreases, players still do not find the new prices affordable, pointing to the ongoing currency and liquidity issues.First, a major regional producer approached the market with $40-60/ton decreases for PE and $20-100/ton decreases for PP. Yet buyers were still disappointed with these decrease amounts. A film and injection products manufacturer reported that they had been anticipating larger decreases from the producer and commented, “If we consider the current dollar parity that we need to obtain from the black market, new lower import prices still cost us a lot. Plus, our end product demand is not satisfying enough to help us to recover our margins.” Gaining support from the fact that the regional producers had to step back from their initial levels during April, in order to conclude deals, buyers are hopeful that the producers are likely to make downward adjustments on their prices in the days ahead. However, believing that adjustments are not going to help in reviving buying interest, a trader, offering on behalf of an another Middle Eastern producers highlighted, “1 USD comes to around 7.50-7.60 EGP in the black market and this situation hampers the import trade. Because of this situation, there is market talk that the producer might revise down their offer levels by the second half of the month. 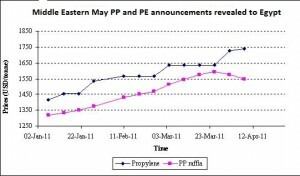 However, we do not confirm these rumors.” This regional producer, who has issued benchmark prices for all HDPE grades with $50-60/on decreases while lacking any actual HDPE availability for May, cut their May PP prices by $20-50/ton and LLDPE film prices by $40/ton when compared to April. “Despite our price cut, buyers still find our offer levels high due to the ongoing liquidity issues and higher dollar parity that they need to obtain from the black market,” he further commented. Meanwhile, inside the local market, the domestic PP producer EPPC has been refraining from offering new prices to the market as they find it hard to set a solid price level amidst volatile exchange rates according to ChemOrbis. Meanwhile, the local HDPE producer SIDPEC closed last week with increases of EGP200/ton ($28/ton), pointing to their need to recover their costs stemming from the higher dollar parity. The producer reported seeing good response from buyers as they claim that their prices retain their competiveness in the market.